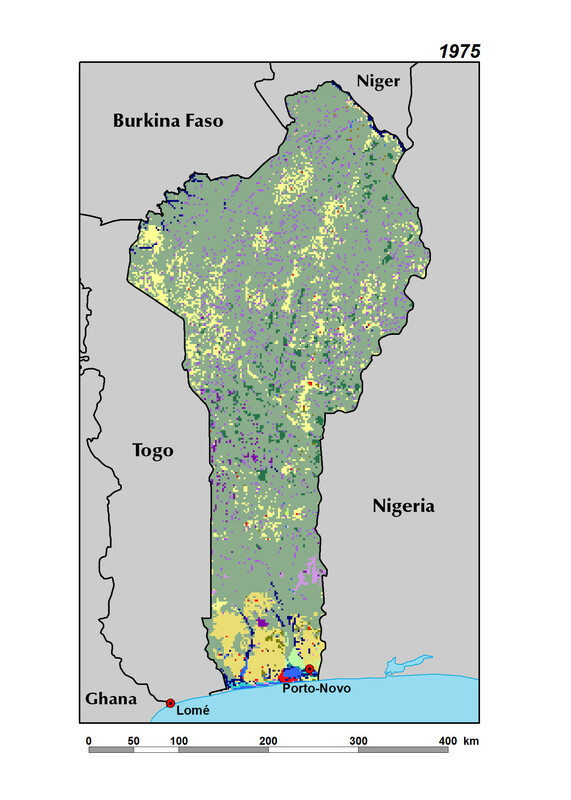 The most obvious change in land cover is the major expansion of agricultural land across most regions of Benin. Agricultural areas (including plantations and irrigated agriculture) progressed from 9.2 to 27.1 percent of the total country area, or an increase of over 5 percent (about 600 sq km) per year between 1975 and 2013. In northern Benin, much of the Pendjari Plain (PEN) and the Northern Pénéplaine bénino-togolaise Plain (PBN) has been spared from these landscape transformations owing to the complex of protected areas in that ecoregion. Rainfed agriculture expansion tends to follow the main transportation arteries. One major axis of development has been the north-south highway from Parakou to Kandi to Malanville. The highest levels of agricultural progression occurred farther south in the Pénéplaine Bénino-togolaise Sud (PBS), along the Dassa-Savé axis. Furthermore, Benin’s agriculture is characterized by cropland associated with oil palm trees. Although they already covered most of the Terre de Barre (TB) plateau by 1975, oil palms farmland increased by about 28 percent over the 38-year period. Associated with agricultural expansion is the considerable fragmentation of Benin’s diverse remaining savannas that range from open tree savannas in the north to wooded savannas in the south. Even though savanna area decreased by 23 percent since 1975, it remains the dominant land cover type in Benin and still covers more than half of the country. A century or more ago, much of southern Benin was still covered in dense, biologically diverse forest. Since then, Benin has lost nearly all of its forest cover. In 1975, very little remained of Benin’s original dense forest (about 700 sq km). 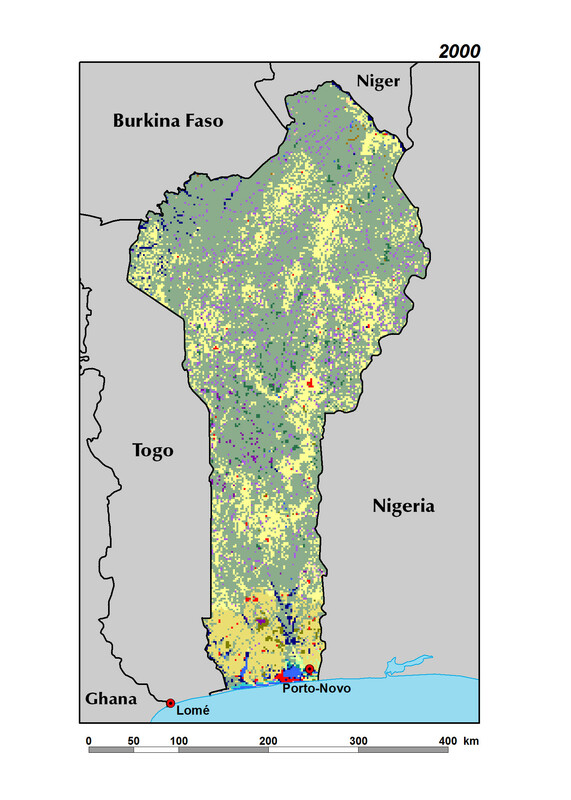 By 2013, Benin lost 58 percent of its remaining dense forest, which now only represents 0.2 percent of the country. Similarly, degraded forest nearly vanished and woodland regressed by 70 percent. Another important forest class found in Benin is the gallery forest, which is the most biologically rich habitat in the savanna zones of the central and northern plains. While gallery forests are limited to a narrow strip of dense canopy trees along the river systems, their total area greatly exceeds that of the few remaining dense forests. In 1975, the gallery forests covered about 6,200 sq km, but they decreased to 4,500 sq km in 2013, a decline of 27 percent. In a country where most people obtain their subsidence from land resources, population growth is a driving factor of land cover change. Indeed, Benin’s population tripled between 1975 and 2013, increasing from 3,263,000 to 10,600,000. As a result, the surface area of villages, towns and cities has expanded by 241 percent. Urban and agricultural landscapes extended to the detriment of Benin’s natural ecosystems, such as savannas, forests, and woodland, which have drastically decreased over the years. Agriculture, the first form of economic activity occupying a majority of the active population,constitutes an essential factor in land degradation and can have major impacts on environmental sustainability.